Podcasts are becoming an increasingly popular communication medium, but if you’re thinking of producing a podcast, how do you choose the best bit rate for your podcast and what are the factors to consider in making your decision? 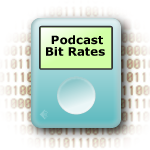 The choice of bit rate for a podcast can be a bit of a balancing act. On the one hand, having high bit rates will give higher perceived audio quality, whilst on the other, they will lead to larger file sizes and hence longer download times for your listeners. So how do you make the right choice? If all this talk of bit rates is leaving you a bit cold, and you’re not quite sure what to make of things, then my previous article on What are bit rates? may help to get you started and point you in the right direction. Essentially, higher bit rates give improved audio quality, but at the expense of file sizes, which become larger, and larger file sizes lead directly to longer download times, no matter what your internet connection speed is! So, when trying to decide on the best bit rate for your podcast, you are really going to want to choose the highest bit rate possible, while retaining reasonable file sizes and practical download times for the majority of your listeners. What download speeds do your listeners have? How long are your podcasts? Are your podcasts predominantly speech? Are your podcasts destined for PCs or MP3 players? If the majority of your podcast listeners are still using dial-up internet connections (narrowband), or have slower broadband connections, then it may be best to err on the side of caution and use lower bit rates, hence keeping file sizes and thus download times down. If you’re not sure what connection speed your listeners have, then your website statistics should be able to tell you. If you don’t have any statistics for your website, you can sign up for Google Analytics, a free service that gives you a wealth of statistical information about your website, to help you on your way. If your podcasts tend to be rather lengthy, this may again prompt you into considering lower bit rates to keep file sizes down and reduce download times. People are far more forgiving listening to speech in lower quality than they are for music. For this reason, if your podcast contains a lot of music which is integral to the podcast rather than just filler, it’s probably worth considering higher bit rates. If the majority of your listeners are likely to listen to your podcast on MP3 players rather than a PCs, then again it could be worth considering using lower bit rates to keep file sizes down, reducing the storage capacity required on the MP3 players. All this might sound wonderful and logical, but how do you translate it to the real world with real numbers? The BBC have been broadcasting since 1922 and are generally acknowledged as setting standards in the world of broadcasting. As a rule of thumb, if it’s good enough for the Beeb, the chances are it’s good enough for the likes of you and me! The BBC have adopted podcasting as a new broadcasting medium and are now heavily into podcasts. As such they have published a range of standards and guidelines for their new media formats. What’s right for the BBC however, may not be right for you. There is no definitive right or wrong, as the choice depends on a number of factors, not least of which is what quality are you happy with putting out? At the end of the day, you can always change things at a later date. You can use the above recommended bit rates as a good starting point and listen to the feedback from your listeners, re-evaluating the situation in the future if necessary. Heya! Do you know where I can download the American Chopper theme song (mp3)? Thank you..! Mike. Thanks for the informative survey of the choices available. I’m gearing up for my first few podcasts for my blog, and your little tidbit about the BBC has helped convince me that 64kbps will be just fine, since my stuff will be almost all voice. As you say, if it’s good enough for the Beeb, it’s good enough for me! I am so glad I found this post. I am beginning to record podcasts to post to my WordPress blog. The recommended plug-in is called WPaudio but I heard that it only allows up to 8 megs per file. Using 64 kps, I am looking at about 1 meg a minute. My podcasts will be around 45 minutes long -way too big. Any advice or other suggestions for a very simply designed WordPress plug-in? Or, because I am using Podbean to store (host) my podcast files, it doesnt matter except for load times. Thanks! For reference, my podcasts are about 20 minutes long and are around 10MB at 64kbps (e.g. 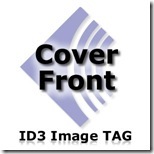 http://www.richardfarrar.com/podcast-the-internet-monthly-november-2010). You could split the podcast into part A and B! This is an old article, but still shows up in searches for the topic. I have found that for voice podcasts you can get down to 32kbps with no noticeable loss in sound quality if you set the MP3 parameters to sample rate of 22050 (half the standard 44100) and mono instead of stereo. That sample rate is good for reproducing frequencies up to 11KHz, more than enough for voice, and if you are not recording your podcast in stereo with different content on the two channels there is no reason not to produce a mono sound file, which takes half the space and puts the same sound in each ear of the headphones. What you say about the stereo is true to a degree (that’s why I tend to do podcasts in mono to get the best quality at a low bit rate), but joint stereo is quite commonly used in MP3 encoding, which muddies the issue. The sample rate is a very important point that you make however, and can be invaluable in saving bits if you’re happy with a reduced frequency response, which probably isn’t too much of an issue for the average podcast. If you’re interested, I’ve also written a post all about joint stereo in MP3 files. Salam (Peace be onto you). This was a great post and bugstomper helped me a lot to achieve this bit rate for my Quran podcast; mp3 32kbps sample rate 22050 mono 11khz constant bit rate. I’m going to use Audacity (coupled with Lame MP3 encoder) for Windows. Hi Amir, Glad to hear that you found the article helpful. I also use Audacity and winLAME to produce my podcasts. Good luck. So glad to find this post… I’m looking to start a podcast version of my radio show which specialises in a certain type of music… sound quality needs to be good. Can either do a 1 hour podcast or 2 hour.. Or split it. What would you recommend and how would you do it? Cheers, Zane. Brilliant article, thank you. I have a question, what do you need Audacity and WinLAME for, is it just for editing? Why the two apps? If editing, should I use wave at a high bit rate to go into Audacity and output to lower rate MP3? Thanks very much, I’m glad you liked the article. It’s a bit of personal choice really, but Audacity is for audio editing and yes it’s best to use uncompressed 16-bit WAV files, 44.1kHz sample rates for editing. Audacity can export directly to lower bit rate MP3s as well, or you could save your edited file as a high quality WAV in case you ever need to come back and re-edit your file. WinLAME cannot edit and is just a standalone converter that you could use to convert WAV files to MP3s. question- is it possible to change the bit rate say from 64 kb to 32kb on the apple phone in order to reduce the audio files from podcast. Hi Richard, thanks I will check with the App store. With regards to the PC I will def. try. You’re welcome, have a great weekend too. I read somewhere that said 1hr = 30mB if recorded in 64kb in mono. Is that not true? That certainly sounds about right. Great thanks. I was starting one with podbean.com and am going to use the 100mb/month subscription to do 3 a month. Just wanted to confirm as I have been hearing different things as to whether or not that’s possible. Thanks for the clarification. You’re most welcome. Good luck with your podcast.